This picture always surprises me. Somehow it doesn’t quite match the tall, willowy, oh-so-elegant princess I had in my head at the time. Maybe it was the turtleneck. I LOVED Halloween when I was a kid. I’m still pretty fond of it today. But when I was little it was all about playing dress up and eating candy. And who doesn’t love that?!? I was one of those little girls who wanted to be something pretty. An angel, a princess–something pink and sparkly. 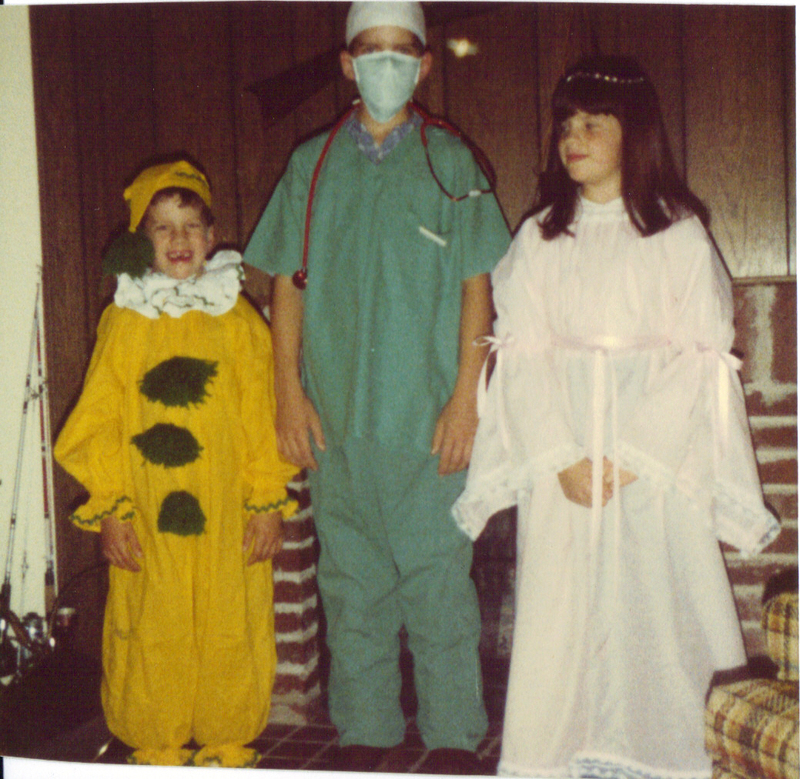 And Mom was a whiz at making gorgeous costumes. Although I’m still a little annoyed about having to wear a turtleneck under my princess dress. Never mind that it was 40 degrees. I could have toughed it out. But trick-or-treating was different when you lived in rural West Virginia. There was no running around neighborhoods or subdivisions ringing doorbells. We piled into the car (angel wings rate the front seat) and drove from house to house. And we knew everyone we visited. Shoot, we were related to most of them. Aunt Dorothy had homemade caramel apples and popcorn balls, Grandma had little piles of candy arranged on a TV tray near the door, Floyd had Reese’s Peanut Butter Cups. And at each stop–especially when we had masks on–there was a great to-do about guessing who we were. When my dad was a kid in the mountains of WV, that was a BIG part of Halloween. You actually tried to disguise yourself so that friends and neighbors couldn’t recognize you. And there were more pranks. Apparently involving outhouses. Halloween was about visiting and laughing and connecting with community. Our current house is outside the city limits on a dead-end road. No one dresses up or sends the kids around. Oh, there are a few decorations out, but that’s it. Everyone takes their kids to the mall or to a ritzier part of town where there are sidewalks. I say they’re missing out BIG TIME. I miss when Halloween was family time. When we got as many hugs as we did lollipops. When we could eat anything we got because everyone who dropped something in our bags knew and loved us. Maybe I’ll TAKE candy to the neighbors this year. Maybe I’ll ask the kids to put on their costumes and try to scare me. Maybe I’ll pretend I don’t know who they are all dressed up like that right up until the moment when I grab them in a bear hug and love on ’em. Now that sounds like Halloween to me.